We are on our way to the beach. After passing the town of Pasuquin on our way to Pagudpud, we come across a stretch of highway lined with shops selling one product, sea salt. Every shop is lined with shelves upon shelves of plastic bags filled with immaculately white, coursely grained salt. Of course, we immediately stop. The beach can wait. A and I stop at this small nipa hut called the Salvacion Store and are met by the owner, Mrs. Salvacion Bulosan. Mrs. Bulosan informes us that most on the salt on display has been treated with iodine. Apparently, there is a local ordinance that requires that locally-produced salt must be sprayed with iodine for health purposes. But as any experienced cook will tell you, iodized salt when cooked not only tends to flavor food much saltier but also leaves a distintive chemical aftertaste. We ask if would be possible to purchase some non-iodized salt. She hesitates. But after a bit of discussion concerning the pros and cons of iodized salt, she relents and leads us to her store’s salt works. It’s a five-minute walk away. We walk down a short side road that opens up into a small plot of land. 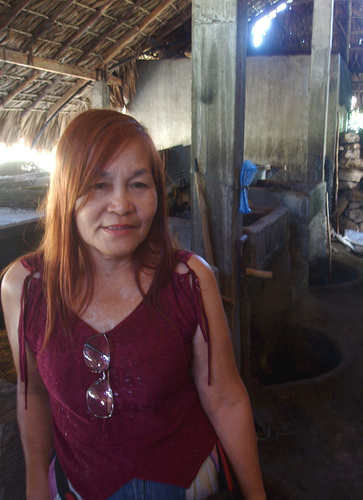 Here, we are greeted by Nino, Mrs. Bulosan’s saltmaker. It’s fairly obvious that they don’t get many curious visitors. Still, Nino graciously lead us into another nipa structure filled with sacks of salt ready for shipment. 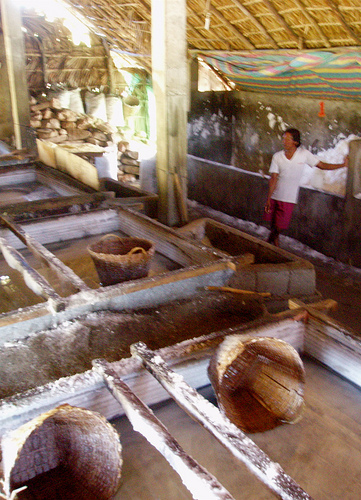 After navigating the maze of salt sacks, we come upon the evaporation pans and ovens used in the making of their salt. Mrs. Bulosan explains that sea water is pumped directly from the sea and kept in a holding tank on site for several hours. Once the sediments and impurities from sea water have settled at the bottom of tank, the sea water is carefully pumped into the waiting concrete evaporating pans. The sea water filled pans are heated by ovens directly underneth. Apparently, local government has banned the use of wood as the primary fuel source to fire up the ovens, so salt producers have to turned to use of the waste by-products created by the production of rice. Dried husks, leaves and stalks are all used. Overnight, the ovens heat the sea water until all that is left is white grainy residue called salt. 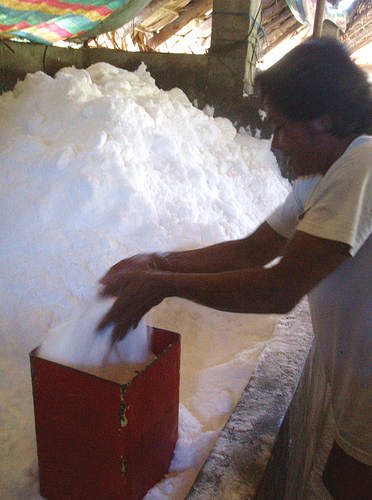 The large grains of salt are collected and refined until they are the required size. The salt is stored in holding areas opposite the ovens. In these holding area, the sea salt is sprayed with iodine weighted, measure and readied for shipment to wholesalers, restaurants and some curious passers-by. I secretly pinch my fingers into this hill of sea salt. To have a quick taste. As I press the grains between my tongue and palete, they immediately melt away releasing a flavour that is unmistakably of the sea. This sea salt is salty, but far more subtle in taste compared to the iodized rock salt I grew up with. For a 10 kg sack of non-iodized sea salt for P60, it was worth the stop. Just don’t tell the authorities. Have you used up all your salt yet? ;) Did you bake some fish in a salt crust? I know. Sea salt from hawaii to shores of france cost so much for a miniscule amount. Now, I have a sack of salt which will last for a long while.